Va Herbert Clark Hoover (10 Luanistyn, 1874 - 20 Jerrey Fouyir, 1964) ny 31d Eaghtyrane ny Steatyn Unnaneysit veih 1929 derrey 1933. 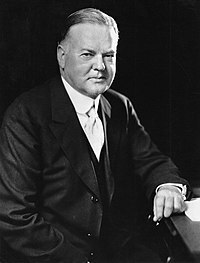 Ta tooilley coadanyn mychione Herbert Hoover ry-gheddyn ayns Wikimedia Commons. Hie yn duillag shoh er ny reaghey er 31 Mayrnt 2019, ec 05:07.